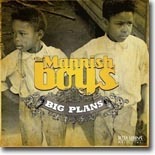 Delta Groove Productions earns its second straight Pick Hit with the great album, Big Plans, by the all-star cast called the Mannish Boys. It took a stroke of genius to pair gospel singer Marie Knight with a Piedmont-style guitarist to do an album of Rev. Gary Davis songs. The absolutely splendid Let Us Get Together is this month's Surprise CD. One of Larry Davis' many brilliant CDs was Sooner or Later, an early '90s release on Bullseye Blues. It's featured this month in our Flashback section. Our What's New section features numerous new releases, including discs from Jimmy "Duck" Holmes, Carolina Chocolate Drops, John Dee Holeman & The Waifs, The Twisters, Matt Walsh, Dave Hole, Hamilton Loomis, Frank "Paris Slim" Goldwasser, Red Beans & Rice, and more.